All the comments are gone, not worth my time fixing, goodbye rlk89.com Blog. Okay, I’m going to fix everything. It may take some time. But I’m going to do it. so be patient. I remember when I was in the eighth grade, we had a fundraiser to “restore” flags that were carried during civil war battles. Unlike a historical building that actually needs to be restored, a flag isn’t going to crash down and be completely destroyed. A flag can mealy be sealed in a preservative container. I remember seeing a picture of one flag that was to be “restored” that was about 4 inches tall and 2 inches wide, if placed diagonally. The plan by these flag “restorers” was to “restore” the flag to it’s original size” Now, maybe it’s just me. I don’t think that adding modernly created fabric to a little tiny peace of a flag that’s nearly 14 times smaller than the addition is appropriate. 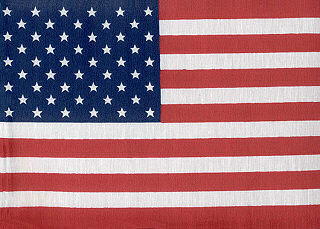 They put a flag like this one display and show it off as a flag carried during one of America’s wars. A kid could look with false pride that the flag is as it was the day it fell. I don’t know about you but I find it unsettling that people could have a flag on display, with one fibber that was originally carried in a war, and claim that it a historic flag. Oh yeah, I’m aware that the numbers I gave don’t really add up, so just take the numbers with a grain of salt. Well this is going to take some explaining. Well it started yesterday, I went to a family function and about half way through I started playing Bocce Ball with my cousin, at the second “round”, I guess you would call it, I looked beyond were the balls were thrown and noticed that there was something laying in the grass, After looking at it for half a minute we determined that it was either a squirrels of chipmunk. 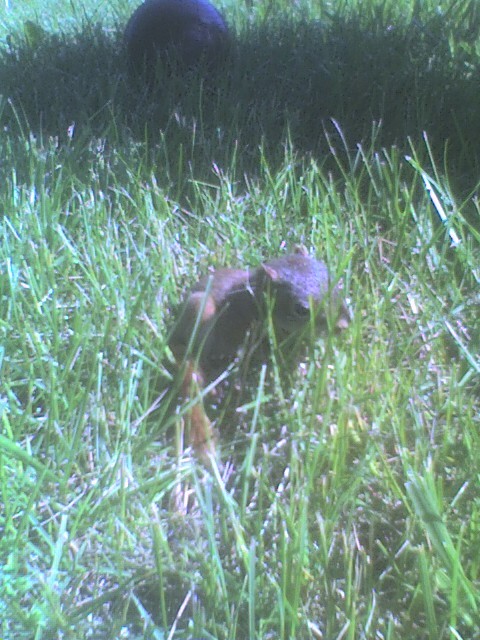 Keep in mind this is out in the middle of the grass somewhat under a tree. 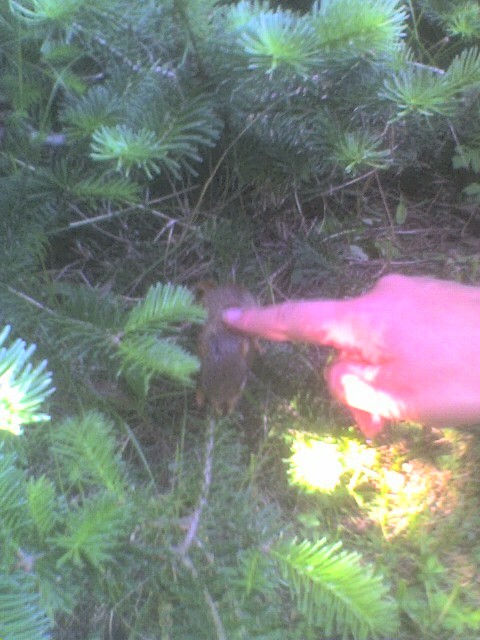 After somewhat determining what it was, we called it a chipmunk, we thought it would be best to move him away from the area, because there was several dogs around us. 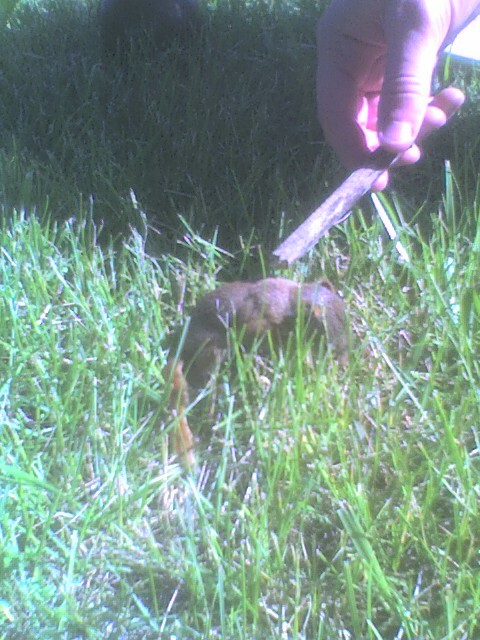 the thing did not seem like it wanted to move so we tried scaring it, moving are hands around it, and even poking it with a stick(see the center picture), and nothing worked, he seemed to think we were playing with it and tried to i guess play back. At this point we we kind of iffy about moving it, but sense the dogs were around I got a glove and picked it up, the thing did not shutter in the least bit. 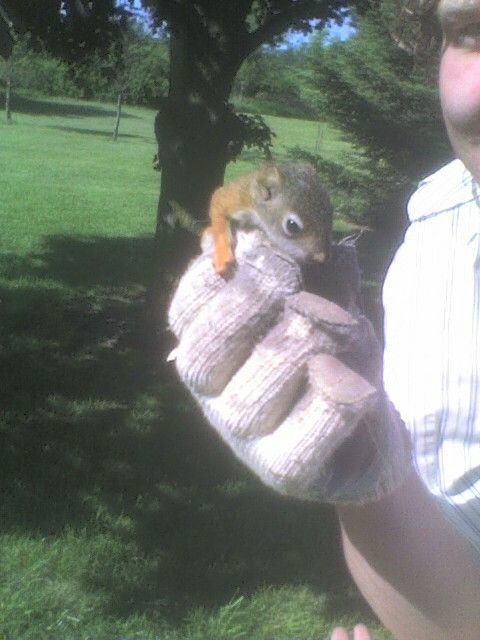 We tried picked it up and it crawled up and down my arm. After some of my family came over to see it, we then tried to get him to go into a woodsy area (right picture). He tried to follow us as we left him. So another causing came up and held it for a while or more accurately sat next to it as it crawled up and around her slowly. I went back to my game. I guess after a while they successfully got him to stay around a pin tree. After pretty much finishing are game we throw the ball around where he was, we saw him just sitting around once again. We finished up are game after that. I took a picture of him once again, this time he was up a tree. So now I have a few questions. First of, what is this animal? A chipmunk or a squirrel? Not that we were being serious, but we talked about “taking him home”. Could you actual train and domesticate this thing? Is it normal for these animals to be somewhat weak and friendly? finally does touching an animal like this, affect it? I mean it’s not like touching a baby bird where the mother will abandon it, right? Although I don’t support these gut’s guy’s cause, I got to love their billboard. As the sun moves across the awning above the billboard, a shadow is placed on the billboard making it look like the level of water is moving up the bilboard as the day progresses. I just started a new blog, Game Influence. With this new site I hope to cover different aspects of gaming news, add some reviews, and talk about some gaming memories that I have. Hopefully It will grow as I add more contributers to the site.